LEESBURG — Maple Leaf Farms made the final of five, $10,000 pledged donations to the Leesburg Lions Club to benefit the Leesburg Summer Recreational League. The Leesburg Lions Club leases the company’s recreational fields each year on behalf of the LSRL. In addition to this, the Lions Club also manages a fund established with company donations to ensure the future of the fields in the Leesburg community. 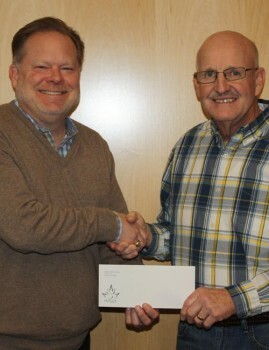 Maple Leaf Farms Co-President Scott Tucker presented the donation to Leesburg Lions Club President Larry Kammerer.